At barely the third month of 2017, California has remained the hottest market till now. It was believed that the 2016 election results would have a major negative impact on this region, but luckily, the market has remained unaffected. There are still ten months remaining (including March), and a lot of speculations are being made in the Real Estate world. 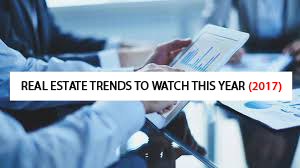 Here are some major trends that we expect to witness in upcoming months. The real estate world has seen a lot of ups and downs regarding prices. There are predictions that the Federal Reserve will again raise the interest rates this year, with a possible increase as early as this month. If these predictions become a reality, mortgage rates will inch up higher. As a result, homebuyers will be able to afford less homes. However, despite the increase in debt repayment, homeowners’ net worth will tend to increase if the upward trend in home values continues as foreseen. New homes usually cost up to 20 percent more than an already existing property. But, with the scarcity of construction workers in the country, a builder has to pay more wages to get the work done. As a result, new homes are also expected to sell at an even higher premium. Foreign investors from across the world are increasingly taking a keen interest in the US market. In this list of foreign buyers, China is the most active player, as per the global market research report Q3 2016 by Global Capital Flows LLC. Investment activity is also seen from nations like Mexico, India, Canada, and the United Kingdom. If we specifically talk about California, San Francisco and Los Angeles are expected to remain the favorites of foreign investors. Though the demand for properties is going to flourish, a shift from luxury properties to medium priced houses is expected this year. A lot of individuals from Gen Y, born early 80’s through mid 1990s, are expected to make their first purchase this year. Various buyers from this group have saved enough to make a down payment for a condo or a starter home. A lot of builders are also shifting their focus to small or mid-sized homes to target this group. We have already witnessed a growth in the use of online resources for marketing purposes in the last few years. This year, the trend is expected to overtake the traditional methods like putting a sign on the front lawn. Some other technologies that are expected to penetrate this market soon include 3D property viewing and virtual reality. As a whole, we are optimistic about the growth of the real estate sector in 2017. If you are planning to sell or purchase a property, it is a wise idea to use the best available information and tools on the market. OpenHouseDay can help with this. Visit https://www.openhouseday.com/how-it-works to see how we can help with effectively planning your open house visits this weekend. And keep up with our social media and blogs for the industry’s freshest tips, tricks, and trends.